Is the G1610T the highest spec CPU that's currently paired with the Gen8 from HP? Been thinking of picking up one of these as a home VM/lab/test box but didn't want to get something underpowered out of gates or that required an immediate hardware upgrade. There is a G2020T model: http://www8.hp.com/uk/en/products/proliant-servers/product-detail.html?oid=5379860#!tab=models. However, if you get the lower powered one, you could swap out the CPU for a Xeon that would give even more power. 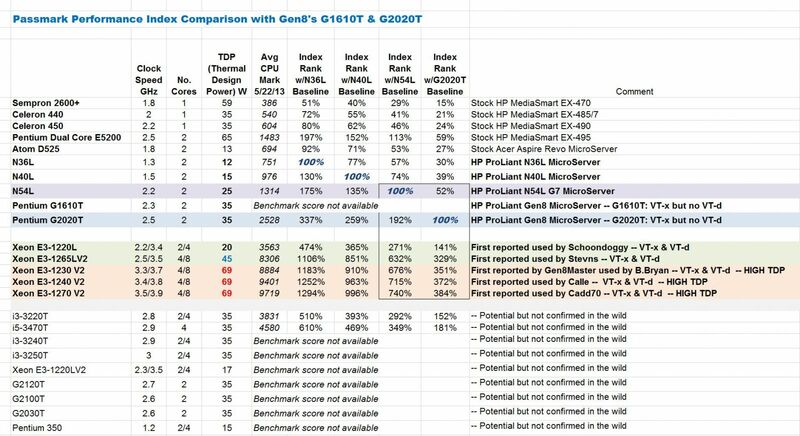 Here's a table comparing the CPU's that's listed in the Gen8 Links thread -- I didn't have a passmark score for the G1610T but you still get the idea I think from the table where it sits -- like ikon said the G2020T is the faster of the two stock CPU's but if you're planning to replace the CPU in the future it makes more sense to get the cheaper G1610T model. OK. Next time they run another promo like this, I'm snagging a G8, 16 GB RAM and a Xeon. I just ordered an open-box 1610T myself for $308; if it doesn't work out, I'll be returning it and seeing if I can't get this deal, which I had no idea of. Planning on selling the N54L and going to Server 2012R2 Standard with the Windows Server Essentials role added. I'm going to need to figure out whether I go HyperV or ESXi; I wouldn't bother, but since MS doesn't offer a nice in-place upgrade from 2012 to 2012R2, I'm not going to be caught without an easy-upgrade path again. Really ticks me off that they can't be bothered to make it a little easier, at least on the entry end. It may be better to pick up a Dell t110 for about 525 when they are on sale again. For the price you get a Xeon, 500gb hard drive, dvd rom drive and 4gb of ram. Not bad for 525. Now it is a bigger pc but you get it at a good cost. I agree with the above post. 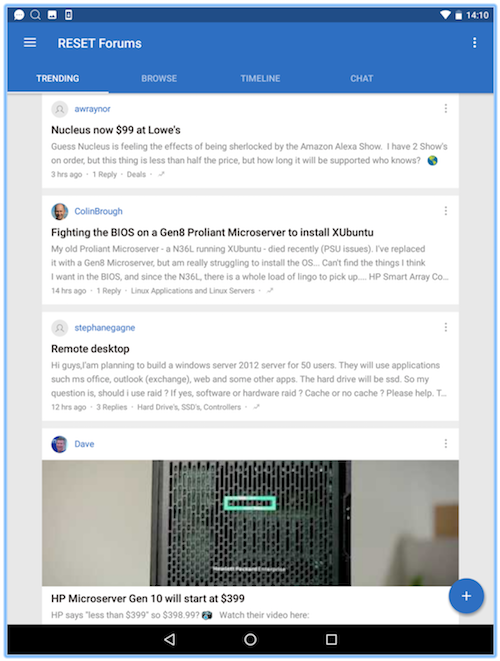 You get a great deal with the G8 and then spend another $250 for Xeon processor? It kind of defeats the whole purpose, right?